Injustice isn’t new, and it isn’t going away soon. Recently, someone in my congregation asked if we were becoming a “one-issue” church in response to being invited to a “Beloved Conversations” curriculum, to be held in collaboration with four other Unitarian Universalist churches in the area. I’m guessing they meant the antiracism work we’ve been doing these past two years. I get it. It seems like it just doesn’t stop. Calls to stand up for racial justice. Calls to learn about yet another grisly killing. Calls out of a more comfortable reality into an increasingly incomprehensible world. I have to admit that I feel a longing for a “simpler” time myself. A time when I showed up to church, heard a mildly inspiring sermon, sang familiar songs, and hung out with people who saw the world much like I did. It was comfortable. It helped me be a better person without demanding too much. Now, every sermon has a justice component to it; there’s always something challenging, something that brings up discomfort and even anxiety. People say church has changed. Well, yes . . . and no. Yes, the church has changed—because the world has changed. At least, what is observable and knowable by the dominant culture has changed. Each week brings another video of an unarmed black man being shot and/or killed by police. Cell phone cameras have changed what it is possible to know about the world around us. But no . . . because the world is much the same as it has been for generations of people of color. Black people have been killed and discriminated against for the entire history of our country without recourse; we are all just seeing the fullness of it now. Their stories were not believed and complaints not taken seriously because white voices, which denied anything was wrong, carried ultimate authority. But with video evidence piling up in every state and hamlet, we have to acknowledge the immense inequities in how blacks and whites are treated in the justice system, from the top to the very bottom. Inequities in stop-and-frisk, arrests, sentencing, enforcement, prison populations—black people are treated as less than whites. It would be wrong to close our eyes and pretend everything is okay when it most definitely is not. As much as we might wish to go back to sleep—to unsee the injustice—it’s not possible for people of conscience, and it certainly doesn’t jibe with the principles we hold as UUs. The first is that we are a liberal faith tradition. Liberal religion is defined by being in relationship with society in the present moment. It means that we believe there are deep human truths that guide our actions, but that those deep truths will be revealed differently in each succeeding generation. In old-time language, we believe that “revelation is not sealed,” and the call of our faith is to look at what is happening in the world around us and find a way to live authentic and engaged lives in the midst of that reality. Today’s reality provides undeniable evidence that black lives count less than white lives in our society. It may not be a comfortable reality, but it is real right now. Our focus as UUs is on this world—how we can live in integrity with the values we espouse in this day and time. Which leads to the second reason our churches will continue to work for racial justice: our Seven Principles. Our First Principle affirms the worth and dignity of every person, while the Seventh acknowledges the interconnected web of life, what happens to one affects us all. In between the First and Seventh are five principles outlining how to live into the two pillars at either end and make them real in the world. I find it impossible to reconcile holding these principles with ignoring the inequalities present before us. Attacking the messenger doesn’t negate the message. Systemic racism exists at all levels of our society and will only change when all of us demand that it change, especially people with the weight of white privilege behind their words and actions. Anyone doubtful that there are still problems to be addressed is welcome to do further reading on our congregation’s Race Resources page. If living into the call of the Principles means we are becoming a one-issue church, then I guess we are. Even as our congregation reduces its carbon footprint by becoming a Green Sanctuary, and reaches out to get to know our Muslim neighbors. Even as we staff the summer shelter, create a program to feed people once a month, and offer opportunities for our young people to understand themselves and their relationship with a changing world. Our one issue is holding up and affirming the value of every person—in whatever way we perceive the need before us to be. Right now, it is impossible to miss the lack of justice for black and brown humans. As long as there is work to be done, it will be the invitation of our church to join hearts and hands in doing that work. Our one issue is love, in whatever way we can offer it to a wild and hurting world. Rev. 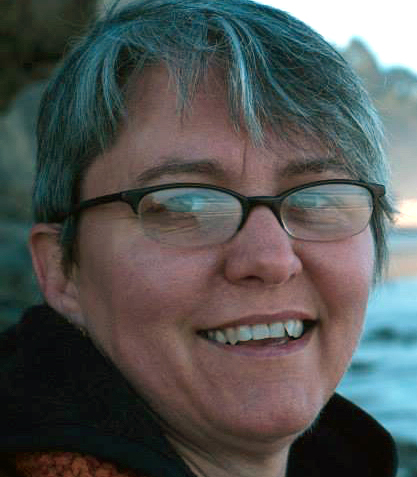 Pam Rumancik is a white, cisgender, queer woman currently serving the Unitarian Church of Hinsdale, Illinois. Coming from working class roots, Pam has run a home childcare business, a restaurant in Estes Park, Colorado, spent a year as a food cart carnie at Bluegrass music festivals, and until attending seminary, was a house painter. She’s passionate about finding ways to communicate across cultural and theological divides that honor the essential truth of each person involved without devolving to the lowest common denominator. She believes that we must live our vision of Beloved Community in the here and now even as we strive to bring that vision of justice and inclusion to the larger world. Pam is the mother of three amazing people, lives with Suki the cat, Theodora Parker the wonder-doodle, and her beloved wife, the Rev Karen Mooney. Both Pam and Karen enjoy long road trips, green spaces and time to explore. Pam is a writer and poet and loves finding things to giggle about on a regular basis. Why I returned to my mostly white UU congregation. As a Jewish UU, I delve into the layers of white supremacy culture without and within.